A Flurry of Research Illuminates Snow’s Foes, by Emily Benson, High Country News, March 27, 2018. It’s Not Just High Temps Messing with Snow – It’s Dust, Brad Rassler, Outside Online, February 7, 2018. Colorado’s Wimpy Winter has skiers, Water Managers Grumbling, Grace Hood, Colorado Public Radio, January 19, 2018. 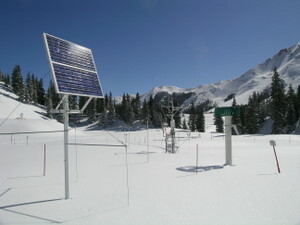 Durango TV News recently snowshoed into our research site to learn more about the SnowEx project. ‘Desert Dust’ causing Colorado’s snowpack to melt early, by Cory Reppenhagen. Denver 7 News Channel, March 27, 2016. Early Snowmelt on the Rockies threatens Arizona’s Water Supply, by Brandon Loomis. Arizona Republic, Aug 20, 2015. Air Quality Difficult to Gauge in Dustier American West by Kirk Johnson. New York Times, Dec 10, 2011. Dust in snow causes early melting in region’s high country by Scott Rappold. Colorado Springs Gazette. Is Pink Snow Hurting the Vail Valley? – Sarah Mausolf. Vail Daily News. March 24 2010. Visionaries: Researcher Tom Painter is more worried about dirty snow than global warming – Cameron Walker. Skiing Magazine. Feb/March 2010. High stakes snow speculation: gauging our water future – Mike Horn. Crested Butte News. January 27, 2010. “What we are observing is snowmelt advanced a month as a result of dust,” Landry says. “Instead of water managers dealing with this in 2050 [due to long-term climate change], they’re dealing with it now. Dust levels may have melted snow – Zach Fridell. Steamboat Today. August 21, 2009. La fonte accélérée des neiges de l’Ouest américain inquiète les agriculteurs: Le phénoméne, provoqué par des tempêtes de poussiére, menace l’irrigation des cultures – Le Monde. June 5, 2009. 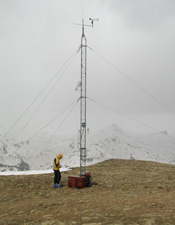 Dust storms speed snowmelt in the West – Nicholas Riccardi. Los Angeles Times. May 24, 2009. 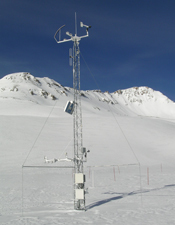 Painter [in association with CSAS and the University of Utah Snow Optics Lab] has found that dust can speed up snowmelt by as much as 35 days — in other words, snow that would normally disappear by May 15 would instead be gone by April 10. Spring runoff to be fast and furious: Snowpack disapearing because of dust storms; Crystal River nears flood stage – Scott Condon. Aspen Times. May 2009. Three of the storms that blew in from the Colorado Plateau farther to the west were particularly intense, according to Chris Landry, director of the Center for Snow and Avalanche Studies. Landry, a former resident of the Crystal River Valley, began studying the dust’s impacts on the snowpack with Tom Painter of the University of Utah in the winter of 2003-04. They found that a particularly intense dust storm in February 2006 accelerated teh melting of the snowpack by about 30 days that spring. The three dust storms that hit March 22, 29 and April 3 this season equaled the 2006 event in intensity. Climate change, water shortages conspire to create 21st century Dust Bowl – Scott Streater. New York Times. May 14, 2009. The Dangers of Dark Snow – Dave Buchanan. The Daily Sentinel [Grand Junction, CO]. May 14, 2009. Dust on the horizon: Record number of dust storms threatens the Southwest – Will Sands. Durango Telegraph. April 30, 2009. If dust seems mroe severe than before, you’re not imagining it. According to Silverton’s Center for Snow and Avalanche Studies there have been 13 dust storms so far this winter, the most since the center began tracking them seven years ago. Dust storms spur environmental fears: Increase in dirt affects ecosystems in Western states – Juliet Eilperin, The Washington Post. April 23, 2009. …Silverton, Colo., seems an unlikely place for a dust storm, especially with two feet of snow ont he ground. “It was almost surreal,” recalled Landry, executive director of the Center for Snow and Avalanche Studies. Rust-red Friday: Massive dust storm blankets much of mountains across centeral, southwest Colorado – Chris Dickey. Gunnison Country Times. April 9, 2009. “Some longtime weather watchers called Friday’s dust storm the worst they’d ever witnessed,” according to Chris Landry, who closely monitors “dust on snow” events for the Center for Snow and Avalanche Studies in Silverton. “The major ramification is the timing and intensity of snow melt,” Landry explained. Dirt-dusted slopes may hasten mountain snowmelt – Catherine Lutz, Aspen Daily News. March 2009. “When exposed at the surface, the dust reduces the reflectivity of the snow, and it directly absorbs solar radiation, so until it’s gone the dust is dramatically accelerating snowmelt”, said Chris Landry, director of the Center for Snow and Avalanche Studies in Silverton. Snow Researchers set to do dust hunting: Researchers studying dust effects on snowpack – Idaho Mountain Express. Feb 2009. 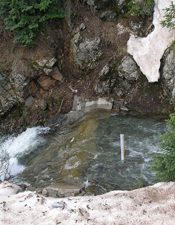 Silverton Study Funded in Water Bill – Joe Hanel, The Durango Herald. Feb 13, 2009. “Recent research from the center has shown that snow covered with a thin layer of dus will melt much earlier than clean snow, possibly causing serious consequences for irrigators.